Howard the Duck as inspired by the classic Marvel comics! Number S07 in the Pin Mates™ Silver Series. Direct from outer space, comes the Howard the Duck Pin Mates™ Wooden Collectible from Entertainment Earth! Proving some of the best things come in small packages, the Howard the Duck Pin Mates™ is created in a 2-inch scale. Howard features highly detailed, brightly colored, 360-degree artwork that includes custom hand-painted art. 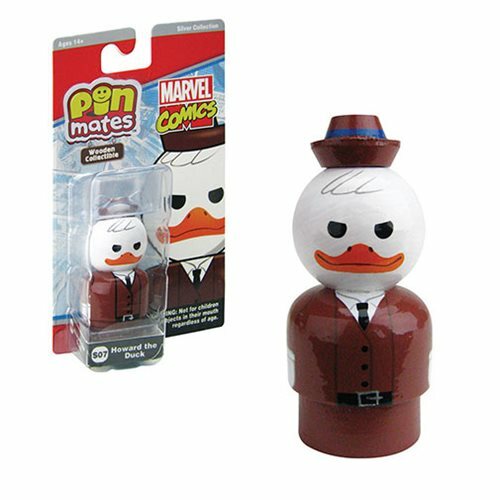 Uniquely numbered on the bottom of the figure and on the packaging, the Howard the Duck Pin Mate™ secures its place as number S07 in the Silver Series for eternity. Ages 14 and up.